This lemon-roasted chicken with wild rice salad is an outstanding recipe for any night of the week. You will find tasty discoveries with every bite! 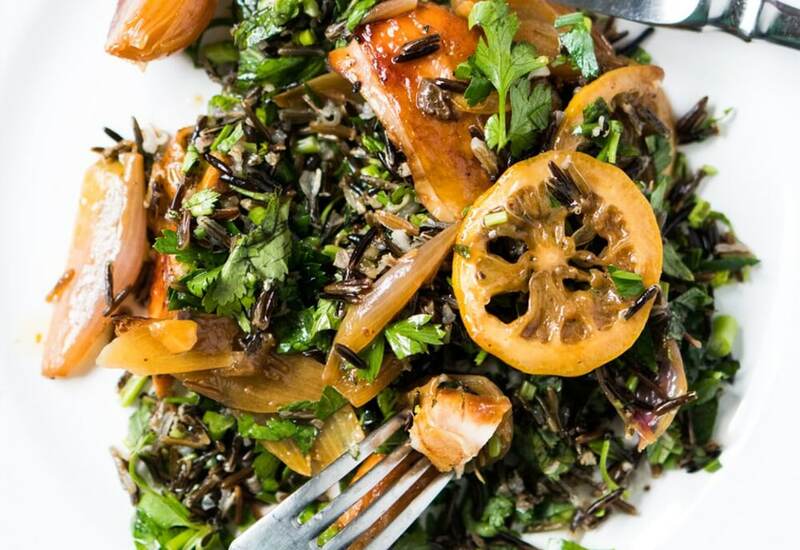 Also, wild rice is gluten-free, low in fat, and high in both lysine and fiber, so this is a meal you can feel good about feeding your family. Choosing bone-in skin-on chicken thighs ensures they stay tender, juicy, and full of flavor. The rich flavor of these chicken thighs stands up to the bold notes from the molasses and fresh herbs in the dish. While the chicken can be marinated for just two hours, leaving it overnight will really make a difference. Plus, prepping part of the recipe in advance cuts down on the workload come mealtime! Per Serving: 427 calories; 22g fat; 46.4g carbohydrates; 13g protein; 42mg cholesterol; 965mg sodium. I've been eating wild rice a lot lately and really enjoyed this dish. I added extra lemon chicken to mine. The dressing was also really easy to make and I plan to use it on other salads as well. I love wild rice, but this was my first time trying in with a salad. I marinated the chicken overnight and the next day it was so full of flavor .Definitely worth it! The dressing was very simple, but really it's all that was needed because the chicken boasts so much flavor. Great salad, so good that it makes you forget that it's healthy.